After being celebrated for excellence in its architecture and interior design at last year’s Ibero-American Biennial CIDI of Interior Design, Design and Landscaping, Grand Velas Los Cabos was nominated and won at the next level in this year’s II World Biennial of Interior Design and Landscaping 2018-2019 Latin America Chapter. A first for any hotel, the interiors, furnishings and decoration of its various restaurants and public areas of the hotel were commissioned to six different firms. The hotel was awarded Gold Medal in the Hospitality Hotels, Resorts & Spa category for excellence in the collective work of its architecture and interior design studios. A first for any hotel, the interiors, furnishings and decoration of its various restaurants and public areas of the hotel were commissioned to six different firms. These included Elias and Elias Architects, Melin Castro Designs, Ernesto Vela Architects, Cassal Diseño, Niz + Chauvet Arquitectos and Ezequiel Farca. The winning projects will compete in October 2019 for the Gold Medal worldwide, with architecture and design studies from Europe, Asia and Africa. Grand Velas Los Cabos is an oasis in the middle of the contrasting landscapes of the area made up of beautiful beaches, boulders, desert and deep blue sea. Ricardo Elias used dividing walls between the balconies of each of the 304 rooms to give a unique character and interesting rhythm to the façade of the hotel. Due to the curvature of the building, these dividing walls of trapezoidal shape mimic white sails. The purpose of the architectural element is to connect the building with its main neighbor, the sea. Another architectural standout is the curved, half-moon design of the hotel. It catches eyes with an iconic grand entrance that’s open air, three stories high and over 300 ft. above sea level. Upon exiting their transportation, guests are immediately greeted with a sparkling ocean view, framed by over scale Velas walls. These great walls were designed to not only give an impressive scale to the space but also block the wind currents and provide shade to make the lobby a comfortable location for guests. The covering of the walls is of wood-textured ceramics in colors of clear and dark sand, and their imposing design of stripes evoke on one side the sea horizon and the other, the rocky character of the destination. Elías was recently recognized by Mexico Design magazine which annually awards a prize to the best of Mexico's architecture for his 40 year career. 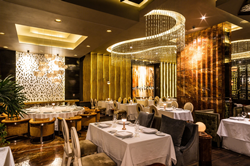 Piaf Restaurant, the resort’s fine-dining French option, was designed by Larissa Garcia of Cassal Diseño Designs. The design inspiration for Piaf was a modern twist on France in the 1940’s to 60’s, when Edith Piaf was at the top of her artistic career. Rich designs, details and dramatic spaces were achieved with both natural and authentic elements. Damasco marble, green Onyx, petrified marble and high-gloss wood were all specially treated to create high-contrast light effects full of shadows and highlights. By playing with lighting, heights, textures, materials and colors, Garcia created a series of ambiances, each with its own charm and feel. To offer each guest a unique experience, each space has at least one dramatic element that distinguishes it from the rest such as a marble-covered center column, an undulating crystal lighting curtain, and antique mirrors in the walls. The design unites as a whole with the furniture selection, a warm color palette and smaller decorative elements. In addition to Piaf, Cassal Diseño was in charge of the interior design for the resort’s duplex Wellness Suites and multi-bedroom Governor Suites. These suites feature cool marble flooring and cream furnishings highlight with burnt orange and sea blue soft furnishing for punches of color. Ernesto Vela of Ernesto Vela Architects led the contemporary Mexican interior design for the Ambassador, Grand Class, Presidential and Imperial Suites in addition to the oceanfront Velas 10 restaurant, Cocina de Autor bar and restaurant and Koi Bar. Each space offers a unique and distinctive personality conveyed by the mixture of shapes and the selection of materials. Natural and warm materials, such as wood and marbles, were used in each of the locations. At Cocina de Autor, the textures, colors and lighting in the design are intended to generate some theatrical attention to the area while the food still remains the true protagonist. The Koi Bar is more dramatic with strong contrasts between the colors. Red highlights black marbles and granites. At Grand Velas Los Cabos, renowned interior designer Melín Castro of Melín Castro Designs was in charge of the design of the striking Lobby, Se Spa, Kids’ and Teen Clubs, Amat Coffee Bar and Boutique. With impressive views of the Sea of Cortez, each area of the lobby coexists in harmony, with a neutral palette of colors to give nature the leading role. A display of art is featured in every corner including a 6 m bronze sculpture from Alejandro Colunga, hanging works from Oaxacan artists Rosendo Pérez Pinacho and Amador Montes, two striking white oak armchairs handcrafted by Matthias Pliessnig, and sculptures by Sergio Bustamante. Architecture, engineering and decoration merge at Se Spa where the resort offers a "desert sand" marble floor that organically incorporates the textures of the desert area of this region. Wood art, matchbook-cut Carrara marble wall, and a standout Water Journey that Grand Velas has become known for are also featured. The Boutique is inspired by contemporary Italian design, with a combination of materials like wood, marble and quartz. With pastel colors throughout, the Kids Club is a small tribute to the streets of Paris and, the vibrant atmosphere of the cafes that bring together locals and visitors of the cosmopolitan city. The state-of-the-art Teens Club offers an urban / street look and feel with blacksmith work in the PlayStation booths, oak wood for the bar and reception areas, and tempered glass for the illuminated dance floor. A highlight of the space is a graffiti painted by artist Luis Macías. Ezequiel Farca, of award-winning design and architecture firm Ezequiel Farca + Cristina Grappin, designed Frida. The restaurant features an environment of the late forties with art deco motifs that is a reminder of a period of glamour in Mexico. Drawing inspiration from Frida Kahlo’s work, elaborate elements and colors are placed carefully within the decorative objects, finishes and furnishing. An emphasis on the dialogue between the European artistic movement and it´s development in Mexico is evident throughout due to the blending of two cultures that were an important part of Frida´s essence and individuality. Frida has a granite floor, wooden ceiling and green emerald tiles with hints of brass for the walls. A copper color painted steel grid with various green tones of exotic marble is used for the reception bar. Blown glass hand-crafted by Mexican artisans and volcanic stones are also used. Farca also designed Lucca, the resort’s traditional Italian gourmet restaurant. It incorporates a contemporary luxury feel with glossy metal details, but also uses traditional natural materials to incorporate warm elements of wood and leather in the design of the furnishings. Lucca features a granite floor, metallic curtain painted in copper color and petrified wood and copper worktop for the bar. Niz + Chauvet Architects brought in the sea to Azul restaurant. A nautical design blends seamlessly into the restaurant’s oceanfront location. Variations of blue play off the colors of the ocean contrasting with the natural fishing rope is crafted into standout ceiling pieces. Geometric tiles adorn expansive serving stations.